Snowmobile backpack HMK Back Country Pack has 1200 cubic inches. constructed of 420 Rip-stop Nylon & 1680 D Ballistic Nylon. Vertical snowboard or skateboard carrier. Large zip front pocket. Zippered tool pocket with key clip. Top grab handle. Two mesh side pockets. Padded shoulder straps and padded back. Adjustable sternum strap and adjustable waist belt for added torso back. Separated zippered access to hydration system pocket with drink tube port. Two External holsters for shovel handle, ice ax or probe. External shovel blade pocket with venting bottom mesh. CD/MP3 music pocket with cord port. Bright lining to attract help in case of emergency. Rugged scuff resistant bottom. 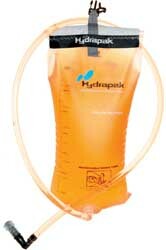 Hydrapak 100 oz. reversible reservoir system not included. 100 oz. (3L) capacity. Compatible with all HMK Packs. Wide mouth opening for easy cleaning. Non-Stick tubing resists bacteria. Insulated drink tube and bite valve cover. Quick draw hose fastener. Easy Flo shut off valve. HMK Backpack is made of heavy duty rip stop & nylon construction. Fully adjustable sternum strap & waist belt for added comfort & support. Padded shoulder straps, shoulder blade & lumbar support. Has individual compartments for shovel, probe, & hydration. Compatible with both the HMK Shor-T & L-Handle shovels. Load compression straps. Rugged scuff resistant bottom. Multiple internal organizer pockets. Soft poly lined goggle pocket. Glove friendly zipper pulls. Embroidered logos. 1300 Cubic inches. Heavy duty Rip-stop & ballistic nylon construction. Fully adjustable sternum strap & waist belt for added comfort & support. Padded shoulder straps, shoulder blade, & lumbar support. Individual compartments for shovel, probe, & hydration. Compatible with both the HMK Shor-T & L-Handle shovels. Soft poly lined goggle pocket. Glove friendly. Single zippered hip pocket. Fly Racing Back Country Pack is the ultimate dual sport/offroad do-all pack. 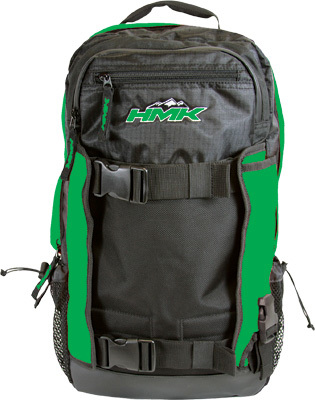 This pack is a backpack, 70 oz. hydration system and a fanny pack all in one. Tool compartment has 14 separate pockets to organize tools and parts. Wide, padded shoulder straps and back panel. Waist and chest straps distribute load to relieve shoulders. Pockets for 2 way radio/cell phone and hydration mouthpiece. Cargo cinch straps minimize bouncing. The ultimate dual sport/offroad do-all-pack. 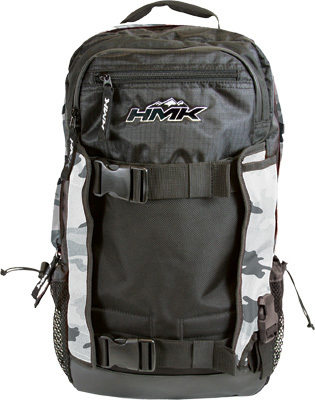 This pack is a backpack, 70 oz. hydration system and a fanny pack all in one. Tool compartment has 14 separate pockets to organize tools and parts. Wide, padded shoulder straps and back panel. Waist and chest straps distribute load to relieve shoulders. Pockets for 2 way radio/cell phone and hydration mouthpiece. Cargo cinch straps minimize bouncing. The Haute Route 35 Backpack is designed with the highest comfort factor in mind. O-Flex frame back system relieves the shoulders and protects the back. Enables access to the main compartment via an All around Zip. 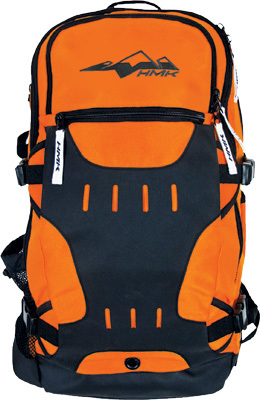 Features Safety compartments, 2 ski fastening systems, snowboard fastener, and pick fasteners. Chest strap with signal whistle. Ice ax and pole loops. Water-resistant zipper. Camera/phone pocket. 100 oz. (3L) capacity. Compatible with all HMK Packs. Wide mouth opening for easy cleaning. Non-stick tubing resists bacteria. Insulated drink tube and bite valve cover. Quick draw hose fastener. EasyFlo shut off valve.